A brilliant introduction, in sticker book form, to an era which changed the world, as literature, philosophy, art, music, politics, and the sciences all flourished across Europe. 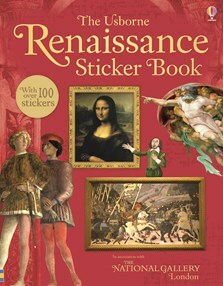 Over one hundred stickers feature famous paintings, drawings and sculptures typical of the period, by artists like Leonardo da Vinci and Michelangelo. This extensive topic has been condensed into sections including religion, artistic patrons, growing cities and the New World. Each page has spaces for stickers to be matched and lots of information about each area. Published in association with the National Gallery. A history reference book with a fun twist.